Dayton Parts Air Springs - Same Quality, Same Warranty as Goodyear and Firestone but lower price. Dayton Parts® Air Springs are engineered to provide superior suspension performance under all types of load and road conditions. 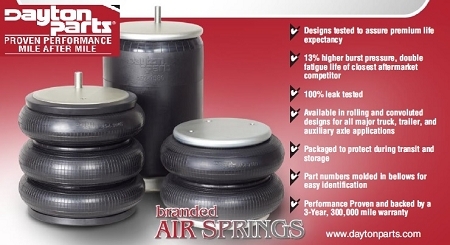 Dayton Parts Air Springs are engineered and produced by a leading OEM air spring manufacturer. This manufacturer specializing in design, manufacturing, and supply of truck air springs/air bags to the commercial vehicle market. These air springs are produced in a single-location facility with a fully integrated production process that includes in-house rubber mixing and compounding. Supplier holds ISO 14001, ISO9001/TS16959 certifications.